Description: Who can work in a house that's overrun by contractors and carpenters? Not Madeleine Houser, a successful novelist who gladly accepts the help of her octogenarian friend, Ginny, to arrange for a temporary office in the charming bed and breakfast owned by Ginny's friend, Arthur. Maddie’s never met the innkeeper––but a friendship grows between them as Maddie and Arthur leave messages for each other each day. To Maddie’s alternate delight and chagrin, she seems to be falling for the inn’s owner––a man who's likely many years her senior––and who she’s never even met. I was so honored when BookLook selected me to be one of the review bloggers allowed to review two of the Year of Weddings novellas. I so enjoyed December Bride and I couldn’t wait to see if the series would continue to be as good. This story was such a delight for me as a writer. After all, Maddie is a writer way behind in her word count and disasters keep happening at her house while repairs are made. 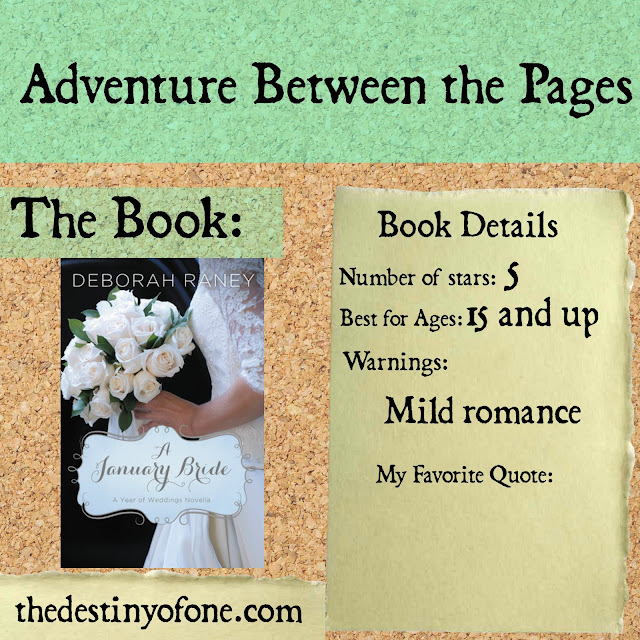 Enter a kind next-door neighbor who has the perfect place to escape - a pretty mansion. Okay, I admit it. I am so jealous that she got to write in such a perfect setting. I laughed so much while reading this book. The misunderstandings and humorous mistakes by the different characters was so much fun without being ridiculous. I really think this book would make an excellent movie. The only down side? I felt that the author of the novella tried to add too much tension toward the end of the book, without the word count to fully explore and work out the issues. That however, was not hard to overlook with the other enjoyable aspects of the book. The romance was sweet and not overdone. There were a couple of kisses, but nothing over the top. I also liked that the romance was based on a friendship first. Granted, it was far quicker than I would like, but it was nice to see nonetheless. I highly recommend this book to romance lovers, writers, and those looking for a short, light read. I received this book from Zondervan via BookLook in exchange for my honest review. I was under no obligation to write a positive review. The opinions in this review are entirely my own.